True is a handsome stout chestnut roan sabino stallion. 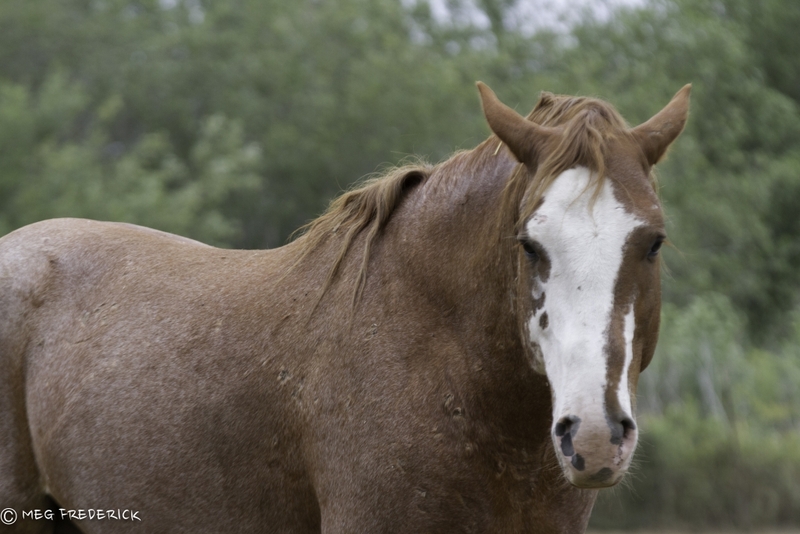 Many of the wild horses roaming our Great Basin are a mixture of draft horses that interbred with horse breeds that were used for cavalry remounts and ranch horses. Over the last few hundred years, they have adapted to some of the most inhospitable regions of our vast Northwestern rangelands, challenged by terrain, weather and persecuted as “tresspassers” by livestock ranchers. True was born in Northwestern Nevada within the Blackrock Dessert in the Calico Complex, the lip of The Great Basin. Five Herd Management Areas (HMAs) make up the Calico Mountain Complex, one of the largest contiguous wild horse ranges. In 2010, life was never the same for this handsome young colt living in Nevada’s remote high desert. On December 28, 2009, helicopters penetrated the remote and pristine high desert and almost 2000 wild horses were chased, captured and scattered to government holding facilities. Freedom lost, families lost forever. True and his family band were part of this devastating event. True was born to General, a stout stallion who fought tirelessly for his families freedom and release from the descending helicopters. Thanks to advocate Laura Leigh who photographed their ordeal, Return to Freedom has been able to do what we could to ” Save the Pieces”. 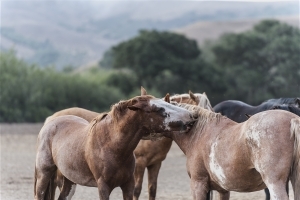 Return to Freedom was able to find True, his father General and two of General’s mares so that they could be reunited back at Return to Freedom’s Wild Horse Sanctuary. True is curious and social and even enjoys a scratch on the neck. He has come into his own and stands his ground with other stallions including his father General. 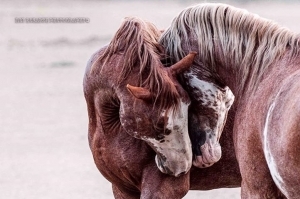 Hope For Calico Mustangs- Return to Freedom Wild Horse Sanctuary embarks on largest Mustang rescue in its 13-year history. Our Sponsor a Horse program is an automatic monthly donation program. It only takes a moment to sign up and your debit or credit card will be automatically billed each month. You can cancel at any time. Will you help Return to Freedom by sponsoring True?